‘Running changes’ are an annual right in the bike industry and there’s a good reason for them. They allow manufacturers to make subtle improvements to a product while still squeezing a return from money previously spent on molds, branding, and education, to name a few things. They let retailers stock up with fresh temptations to keep the cash register humming. 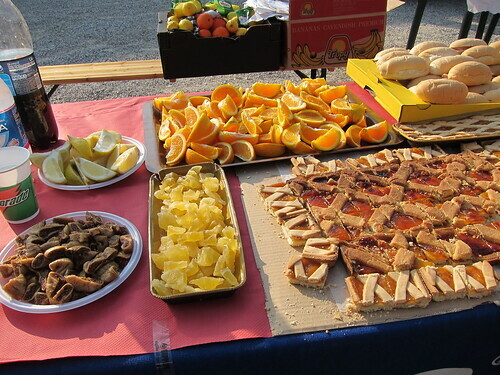 And for consumers it’s joyous new fodder for mid-ride conversation, not to mention a boost of inspiration for those days when training seems like a chore. From this, a question: When are accumulated running changes so transformative that they warrant a product name change? Take a company like Zipp, for example. 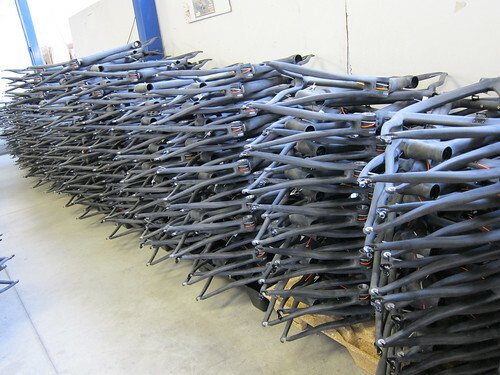 Although the 2011-era 404 wheelset bears only faint resemblance to the 404’s of 2005, the name has remained the same. A good idea? Based on its sales and sparkling reputation in the marketplace, the answer appears to be yes. 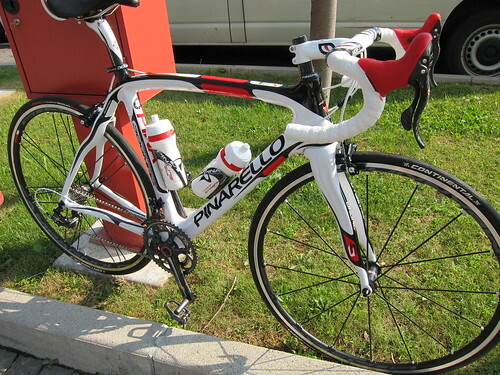 An interesting point of comparison is the Pinarello Dogma. 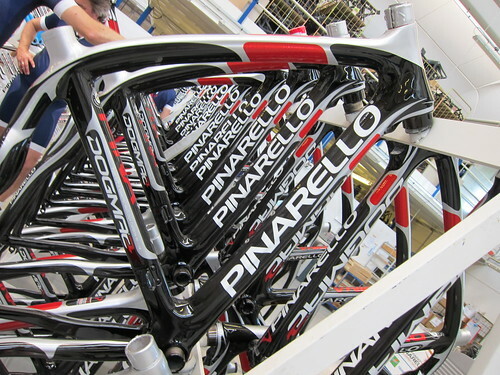 When Pinarello introduced the frame in 2010, it confirmed the brand’s place at the top of the hierarchy of Italian bike brands. The Dogma is aesthetically exquisite and the combination of its construction and geometry means that it rides dreamily in every situation. 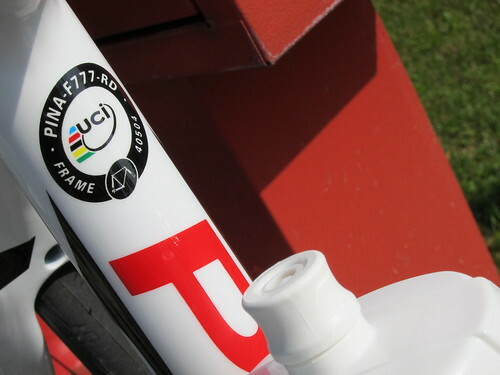 It quickly earned impressive palmares in the professional peloton, cementing its reputation as a race bike of the most serious order. Reviews -- whether in the media or in bike shop conversations -- affirmed that its hype was deeply supported by substance. 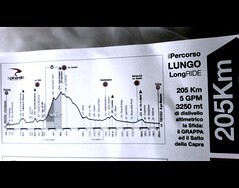 And now, two years later, Pinarello is following up with the all-new Dogma 2. It’s a bike that, after some serious test riding, proved its extraordinary nature to me. There’s no need to debate whether the Dogma 2 is the most alluring bike money can buy. If you factor in all of the variables -- curb appeal, street cred, ride quality -- it is the undisputed champion. As lofty as this praise may be, I wonder if the Dogma 2 warrants its new name. This isn’t to question the benefits of its changes. But it doesn’t represent the sort of dramatic platform change often accompanied by a re-naming. Am I over-thinking this? Perhaps the mere act of adding a ‘2’ isn’t tantamount to a true re-naming. My head spins with thoughts about branding, marketing, and inventory management. Yet it’s all soothed by one key fact: The sweetness of its performance on the road. 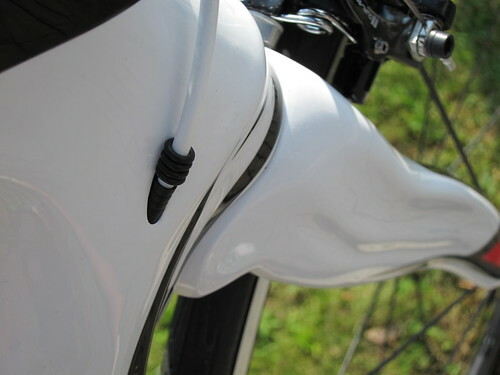 Pinarello took big steps to reduce aerodynamic drag with the Dogma 2, the most obvious a new integration between the fork and the frame. 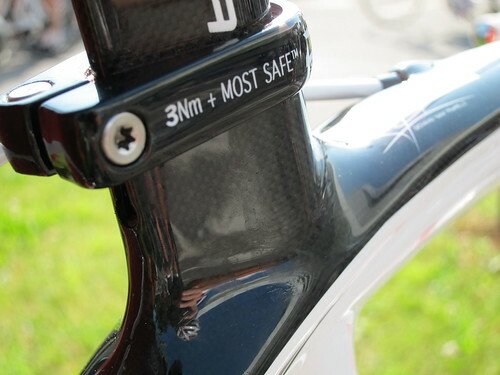 You’ll see that the Dogma 2 has a fin-like extension at the trailing edge of the fork crown. It sits snugly into a notch at where the headtube and downtube meet. 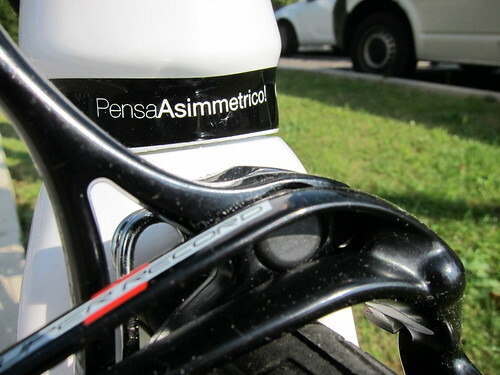 Add internal cable routing and the result is a 6 percent reduction in frontal drag. 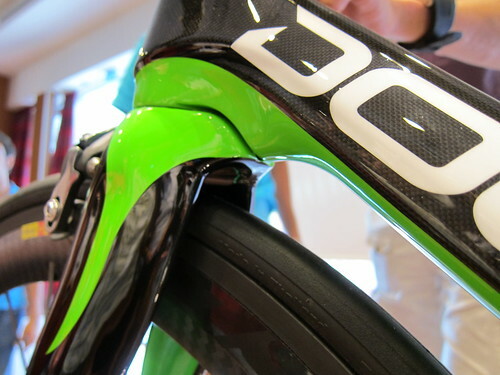 Other changes with the Dogma 2 include enhanced asymmetry in the top tube and downtube to give it a boost in lateral and torsional stiffness. 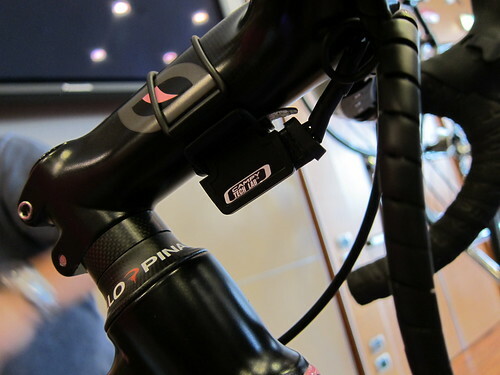 And in terms of nice small details, Di2 (and Campy electronic) batteries will mount on the Di2-specific Dogma 2 without a battery harness. 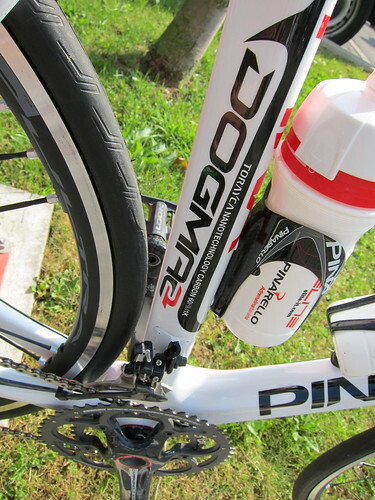 Pinarello will have a battery mount similar to water bottle braze-ons. Say goodbye to zip-ties! And the bottom bracket guide will detach from the shell to make internal cable routing a lot easier to string up. 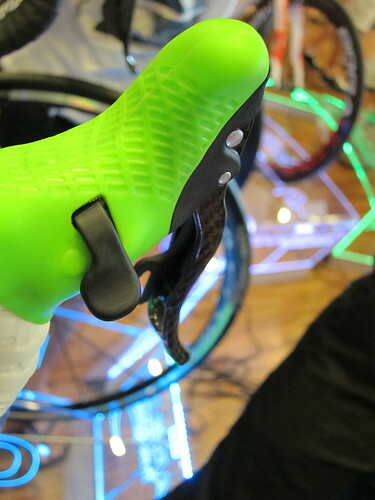 One final highlight was our first in-person look at Campagnolo electronic. What I learned was the following: (1) The chances that this will be released in 2012 is seemingly nil. 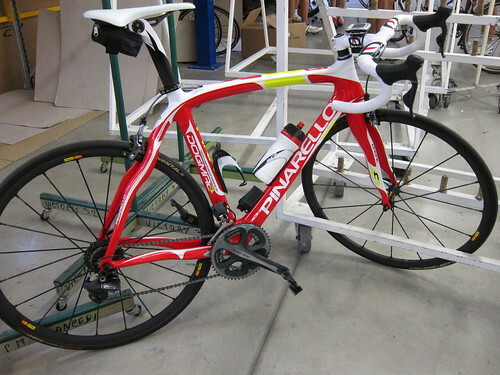 Pinarello has the only current sample available in the world, and it didn’t appear to be a working sample. (2) The shift buttons seem to rely on your thumb, in a not-dissimilar fashion as mechanical Ergopower. 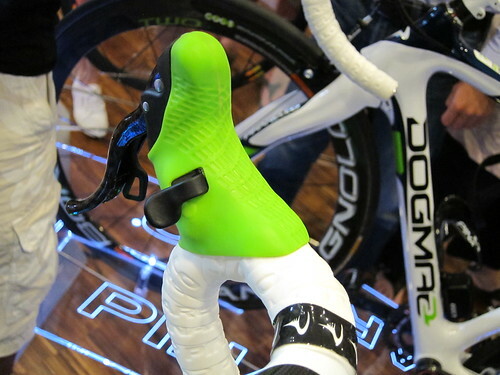 At least at first glance it didn’t have the same cleanness as Shimano Di2. 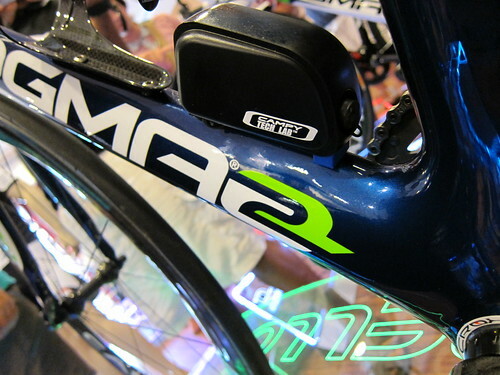 (3) Pinarello-sponsored Team Movistar is the only team in the peloton using Campagnolo electronic. 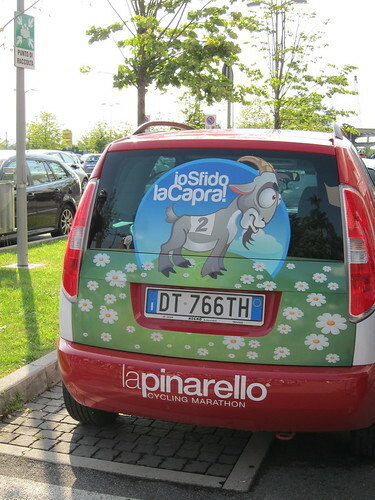 As part of this relationship, Pinarello stated that they’ll be the first company in the marketplace to offer a Campy electronic bike. When? They didn’t say. But they said they’ll absolutely be first.